The package includes two nights in an on-site, two-bedroom residence, two lunches and two dinners per person, use of a golf cart for exploring, free round of golf for two and access to the clubhouse, pools, fitness centers and an informative sales presentation. You’re also invited to join classes in aerobics, Zumba, jazz, tap and more. Total price is just $149 for two guests age 55 and up. Send me more information about this Heritage Shores Discovery Package! 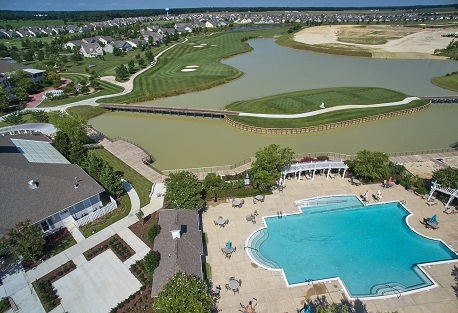 Heritage Shores, DE: Relaxing and invigorating at once. And when the sun goes down, you can relax in a stylish, low-maintenance new home where all you need is all on one level. Choose from home designs from Brookfield Residential and Ryan Homes–at a price you’ll love. Send me more information about this Heritage Shores Discovery Package! This gorgeous course is always kept in excellent shape and is a past winner of Golf Digest’s Best in the State Award. Send me more information about this Heritage Shores Discovery Package! Think of all you get at Heritage Shores — the home, the amenities, the lifestyle. Now think of all you save. Delaware is the perfect place for 55+ homebuyers, because its tax-friendly laws keep more of your money in your own pocket. Send me more information about this Heritage Shores Discovery Package!